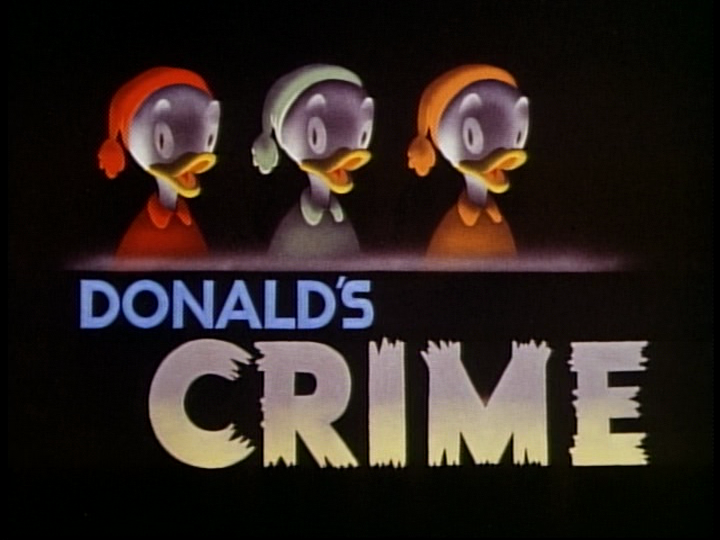 On June 29, 1945, the Donald Duck short film Donald’s Crime was released to theaters. The film was nominated for an Academy Award, but lost to the Tom and Jerry short film Quiet Please! It was directed by Jack King, with story by Ralph Wright. 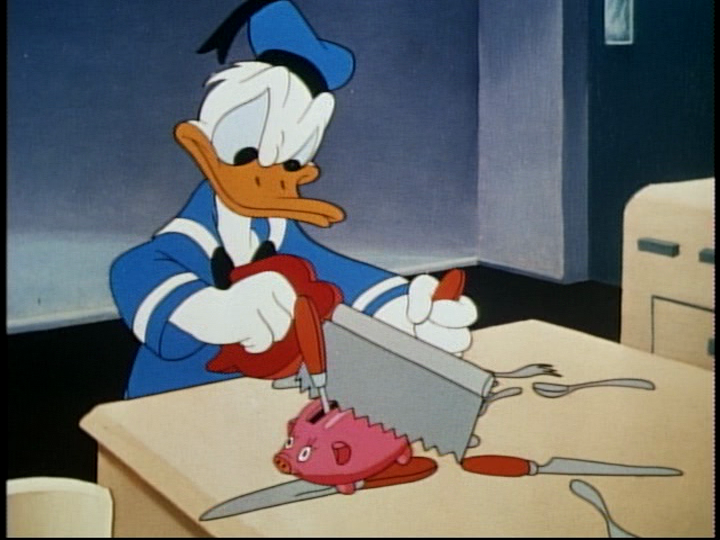 Donald is excitedly preparing for his date with Daisy, when he realizes at the last minute that he’s broke. He spies his nephews’ piggy bank sitting on the table, and hears a voice telling him that it’s the answer to his problem. He tries to resist, knowing it would be wrong, but the voice keeps telling him that no one will know, and he should take it. He gives in to temptation, just as his nephews start playing around his feet. They ask him what he’s doing, and he demands that they go to bed as he tries to hide the piggy bank. They quickly run upstairs, saying their prayers for Daisy and Uncle Donald before they fall asleep. Donald uses every tool he can to get the money out of the bank, but the bank breaks, leaving him with all of the money. He suddenly hears the nephews calling for him, and he runs upstairs, sweating with guilt. He thinks they are on to him, until he hears them ask for a kiss goodnight. He feels like a skunk for stealing their money, but soon forgets it as he takes Daisy out for a night on the town. After he brings Daisy home, he floats away on a cloud after she give him a kiss goodnight and calls him a big shot. The voice he heard before boosts his ego, before bringing back all of the guilt from before. The guilt gets the best of him as he starts to act like he’s a gangster, with the police after him wherever he goes. He runs around town before spotting his own face on a wanted poster, with a reward of $100, dead or alive. As he pulls the poster from the post, another one is posted behind it, with the reward increasing to $500. The more he pulls the posters, the higher the reward, until the zeros start to circle around. He flees again and ends up in a blind alley, and thinks he’s in jail, pulling on the bars of the door in front of him, when a sign falls on his head. He looks up to see that he’s at the service entrance of a café, and there is help wanted inside. He decides to take up the job and pay back the money for the nephews. However, when he finds he’s paid them one nickel too many, the nephews spot him trying to get the money out, and they throw a tantrum while he fidgets nervously. Posted in Uncategorized and tagged 1940s, Academy Award Nominated, Color, Donald Duck, Short film. Bookmark the permalink.